(Chillicothe, Ohio: February 28, 2017) – The numbers are in! Petland stores nationwide raised more than $130,000 during the 2016 St. Jude Halloween Pin-Up Promotion benefiting St. Jude’s Children’s Research Hospital®, which is leading the way the world understands, treats and defeats childhood cancer and other life-threatening diseases. Several franchisees and store operators have visited the hospital and the St. Jude Target House, one of the three housing facilities where families live during treatment. These franchisees have proven to be leaders in pushing everyone at Petland to raise more money, Kunzelman said. Petland first partnered with St. Jude in 2009. The St. Jude Halloween Pin-Up Promotion, now in its 26th year, asks customers to donate $1 or more at the register during the month of October to support the hospital’s lifesaving mission of finding cures and saving children. In exchange for the donation, customers sign a St. Jude Halloween-themed pin-up which is displayed in the store. Petland also initiated a corporate campaign for thehome office, offering payroll deductions for donations. 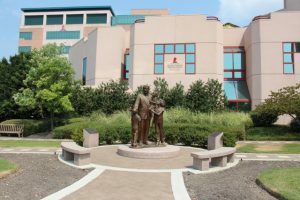 Treatments invented at St. Jude Children’s Research Hospital has helped push the overall childhood cancer survival rate from 20 percent to more than 80 percent since the hospital opened more than 50 years ago. Because of fundraisers like the St. Jude Halloween Promotion, families never receive abill from St. Jude for treatment, travel, housing or food – because St. Jude believes all a family should worry about is helping their child live. Petland, Inc. is a franchise operation with quality, full service retail pet centers across the United States, Canada, Japan, China, Mexico, South Africa, Brazil and El Salvador. For more than 47 years, Petland Pet Counselors have been dedicated to matching the right petwith the right person and meeting the needs of both. To its customers who already have pets, Petland is dedicated to enhancing their knowledge and enjoyment of the human-animal bond. Petland was founded in 1967 and is headquartered in south central Ohio. For more information on Petland, visit www.petland.com. St. Jude Children’s Research Hospital is leading the way the world understands, treats and defeats childhood cancer and other life-threatening diseases. It is the only National Cancer Institute-designated Comprehensive Cancer Center devoted solely to children. Treatments invented at St. Jude have helped push the overall childhood cancer survival rate from 20 percent to 80 percent since the hospital opened more than 50 years ago. St.Jude is working to drive the overall survival rate for childhood cancer to 90 percent, and we won’t stop until no child dies from cancer. St. Jude freely shares the discoveries it makes, and every child saved at St. Jude means doctors and scientists worldwide can use that knowledge to save thousands more children. Families never receive a bill from St. Jude for treatment, travel, housing or food – because all a family should worry about is helping their child live. Join the St. Jude mission by visiting stjude.org, liking St. Jude on Facebook (facebook.com/stjude) and following us on Twitter (@stjude). We know that the first few months of owning a new puppy are sometimes the hardest! Sticking to a training schedule and teaching your newest family member right from wrong is a long process, no matter how much your love your pup! That’s why some breeds are better than others for not only brand new owners, but also people who haven’t owned or trained a new puppy in a while. Check out our list of easy to train dog breeds to see if any of them might be a match for you! Did you know Petland has puppies for sale? Check them out here! 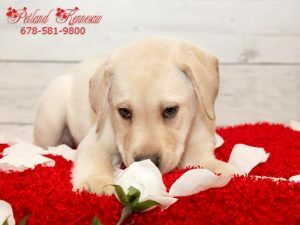 It’s no wonder why the Lab is always at the top of the list for most popular dog breeds. They are hard-working, easy to train and do great with all types of families. The Lab is also fiercely intelligent and takes to training very quickly. We did an entire blog about this wonderful breed here! Want to check out all of our precious available puppies? Click here! The beginning of dog ownership is filled with lots of love and cuddles, but it’s also the foundation for how your newest family member will behave over its lifetime. Here at Petland, we want to make sure you have all your bases covered when starting dog training with your new puppy. So if you have already brought a new little one home or you are seriously considering adding a puppy to your family, check out our tips for getting your dog training off to a great start! When beginning a regimen for training, you need to make sure you have the supplies to help you every step of the way. Petland stocks all the latest and greatest when it comes to training! If you are housebreaking, it is imperative to have a correct size crate and establish a routine of “potty times” for your new puppy to get in the swing of things. You will also need an array of stain and odor removers, housebreaking aids and, of course, lots of training treats! Our dedicated Pet Counselors can help you select the right training tools for you and your companion. Socialization is so important for your new puppy! Training them to accept new people, animals and various places while they are young will help make them a better-behaved pet long term. Socialized dogs are happier, less likely to develop behavior problems and are generally more welcomed by others. It is also paramount when socializing your puppy to have proper leashes, collars and harnesses to keep them safe and close to you. We have a wide variety of colors and styles to choose from and we are happy to size collars and harnesses for any puppy or dog! At Petland, we strongly suggest that every puppy that goes home from our store participate in our dog training program. Basic commands are a great way for you, as the owner, to establish dominance and training practices with your new puppy. Basic commands can help you overcome common dog behavior problems and will help keep your dog safe. Dog tricks are a great way to take your dog training to the next level and give your dog some mental stimulation as well! Why Kitties Purr and More Interesting Facts about Cats! Alright people, these are mysteries of the universe here! 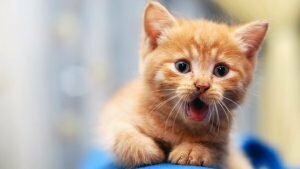 We are very attached to our feline friends and we wanted to put together a blog that explores all the interesting facts about cats that you can handle. We hope you find this blog both interesting and informative! Cats have their own language and they only talk to humans. Meowing is actually a language developed by cats to communicate with their owners. Cats that live together typically don’t meow or “talk” to each other and groups of feral cats are almost completely silent. In recent studies, owners were able to interpret different sounds and meows from their cat relaying what they wanted. So who really owns who here, huh? Ladies are right-handed and Gentlemen are left-handed. What? That’s right, you heard it. Cats are similar to people in that they have a dominant hand…or paw, more specifically. Even though this seems like a fun piece of “Is it actually true?” trivia, it does have a scientific basis. A study done in Ireland proved that female cats were all right-handed, with one case of a feisty one refusing to take part in the study. And all the males in the study were left-handed, with a sole cat showing an ambidextrous proclivity. The purpose of the purrrrrrrrr. If you thought that cats only purr when they’re happy, you would only be partly right. Even though we still don’t know how cats actually make the sound, it is linked with a behavior that cats like. In essence, through purring, the cat it telling you to continue whatever it is you’re doing, petting them, cuddling them, etc. But cats purr in other situations too, like when they are scared or hurt. Researchers think this is because cats purr at a frequency of 26 hertz, the same frequency that’s been found to promote healing in bone and other body tissues. So cats are either trying to heal or maybe comfort themselves. They have also been found that cats will curl around another animal that is injured or scared, trying to help perhaps? Just in case we needed another reason to love these furry creatures! We hope you enjoyed this blog and learned some interesting facts about cats in the process! Wow all your friends with your newfound knowledge and remember to keep up to date with our posts. Want another blog about cats, boom! Click here! House Bill 144 – The Facts You Need to Know! HB 144 – GA Retail Pet Store Purchase Protection Act, What’s at Stake? Without HB 144, the only vaccine a retail pet store must give is a rabies shot. With HB 144, animals will be vaccinated against as many as nine diseases. Without HB 144, retail pet stores can purchase dogs and cats from problem breeders with multiple violations. With HB 144, only qualified, licensed breeders free of certain violations can sell to retail pet stores. Without HB 144, state law does not give consumers even a one-day return policy at retail pet stores. With HB 144, consumers will have 14 days to have a pet examined and determine if there is an illness requiring return. Without HB 144, state law does not require reimbursement of veterinarian expenses to diagnose and treat a sick animal soon after purchase from a retail pet store. With HB 144, consumers are reimbursed for reasonable veterinarian expenses and have other remedies. Without HB 144, retail pet stores are not required to give consumers any information about the breeder, the recent veterinarian exam or last treatment. With HB 144, retail pet stores must be transparent and give purchasers information about the breed, the breeder and license number, when the animal was received, and its last veterinarian exam and any treatments. Without HB 144, animal rights activists can use local government to ban retail pet sales. With HB 144, retail pet stores can sell legal products to meet consumer demand without fear of forced closure. Without HB 144, an error in current law (line 51) could be exploited and everyday Georgians could be required to register as pet dealers in order to sell the occasional litter or a dog or cat they happen into. 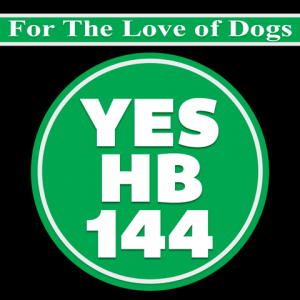 With HB 144, the current exemption in state law is corrected to ensure individuals, small kennels & breeders of hunting dogs are protected from having to register as pet dealers. Without HB 144, Georgia has no comprehensive consumer protections for retail pet stores in state law. With HB 144, Georgia becomes the 24th state to enact a Pet Purchase Protection Act that protects animals and consumer choice while providing clear legal recourse to consumers who purchase animals determined to have a disease or defect. A national trade association for the retail pet industry is working with several different retailers and other animal companion groups on House Bill 144 (view here). Your help is needed to voice your support on legislation protecting consumers, pets, and consumer choice. We support this legislation because it increases vaccination standards, provides for reimbursement of veterinary bills for illness and disease observed within two weeks from the date of purchase, strengthens standards for breeders selling into our stores and requires that pet stores provide consumers with more information about the animals they are purchasing. None of the consumer protection standards provided for in HB144 exists in state law today. Retail pet stores that comply with these new standards also get the assurance they will not be forced to close by local communities acting on behalf of extremists in the animal rights community. These extremists are trying to misconstrue what HB144 accomplishes in order to continue their fight to close retail stores and require that companion pets be obtained from rescue organizations only. Although it is admirable to acquire rescue dogs, they do not always meet the demand and needs of consumers. So far lawmakers have only heard from the opposition. My family is the proud owner of a pet purchased from a retail pet store. I support House Bill 144 because it better protects consumers, animals, and consumer choice. I support this legislation because it allows me to obtain the pet of my choosing, requires more transparency or records, provides for payment by pet stores of veterinary bills, and increases the buying standards of pet stores by requiring that they buy from the best USDA and GA licensed breeders only. These reforms will better protect thousands of dogs and cats. Without HB 144, extremists in the animal rights community can use local government to close pet stores and take away my freedom to choose the pet I want as my companion. Please look for another alert in the coming weeks when it is time to communicate with the State Senate members. Thank you for being a loyal customer and supporter of consumer choice.